Dr. Martin Luther King Jr. Day, January 18, 2018, is a national holiday that honors the life and work of Dr. King. He often posed the question, “What Are You Doing For Others?” Union strives to answer that question in our quest to focus on social justice and social responsibility as part of our mission to engage, enlighten, and empower our students and in the Dr. Martin Luther King Jr. Studies Specialization program. Student Pearl Bates shares how she is planning to continuing Dr. King’s legacy in the Q&A below. A. With the completion of my degree, I want to continue writing about the intersections of faith and women and gender issues, as well as the impact of policies that primarily impact women of color and sustain poverty and economic inertia. A. What led me to the MLK program was the opportunity to study about one of the most impactful faith leaders of our time, and to converse with like-minded up-and-coming scholars and expert faculty. A. What led me to UI & U was the quality of the faculty, the emphasis on social justice, and the fact that the program is firmly grounded in interdisciplinary studies. A. The advice I would give to my 20-something self is live your best life with full-intention and don’t allow yourself to follow anyone else’s dreams for you! You are special and unique just the way you are – honor yourself and your God, and life will give you back in good measure what you put into it. And finally, do your absolute best in whatever you undertake. You might be surprised at who is watching you and for what reason. Pearl Bates is a self-described feminist/womanist liberation theologian. Additionally, her career has spanned several industries and has allowed her to utilize her strategic management and communication skills in her roles as general manager, assistant managing director, and manager of research operations. Her career took a sharp turn after the shocking events of 9/11 when she enrolled in seminary at Drew Theological School and concentrated her studies in theology and ethics. Initially intending to pursue a career in ministry and the chaplaincy, she was redirected by two of her mentors and professors, the Rev. Dr. Lynne Westfield and the Rev. Dr. Traci West, to the teaching profession. Acting on their wisdom and keen insight, she began her teaching career in 2007 at the City University of New York leading a course titled The Dynamics of Interpersonal Communication with para-educators in the NYC public school system. After five years leading the course, Bates was led to pursue an advanced degree in Elementary/Special Education. 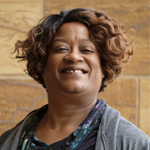 Bates has utilized this degree to assist her students at Pillar College in Newark, NJ where she leads underserved and underprepared non-traditional college students in courses across the curricula in Biblical Studies, Education, and General Studies. Bates believes that this is one of the best ways in which to follow her calling and to make the most impact in continuing Dr. King’s legacy of working toward economic empowerment and justice for those historically excluded from such opportunities. She is currently pursuing a doctorate in Public Policy & Social Change with specializations in MLK and Women & Gender studies at the Union Institute & University. Her research interests include black womanist/feminist ethical thought, race and gender politics, and black feminist pragmatism. She holds a Bachelor of Business Administration and a Master of Science, Elementary Education from Pace University. Discover the impact Dr. King can have on your life and others in the MLK Studies Specialization. Click below!